Lionsgate has just released a great, extended, clip from the upcoming Conan The Barbarian. "I live. I love. I slay... I am content." The colossal legend that is CONAN THE BARBARIAN is back this Summer. Having thrived and evolved for eight decades in the public imagination - in prose and graphics, on the big screen and small - Conan's exploits in the Hyborian Age now come alive like never before. Shot in 3D, the reimagining of one man's mythical battle for revenge is finally here in this Epic action-adventure film. 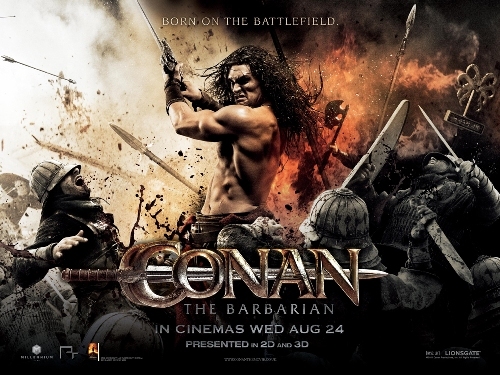 Deftly adapted from the original works of Robert E. Howard and faithful to the mythology and psychology of his iconic character, CONAN THE BARBARIAN stars Jason Momoa, Rachel Nichols, Stephen Lang, Rose McGowan, Said Taghmaoui and Ron Perlman. The film is directed by Marcus Nispel, and written by Thomas Dean Donnelly & Joshua Oppenheimer and Sean Hood.